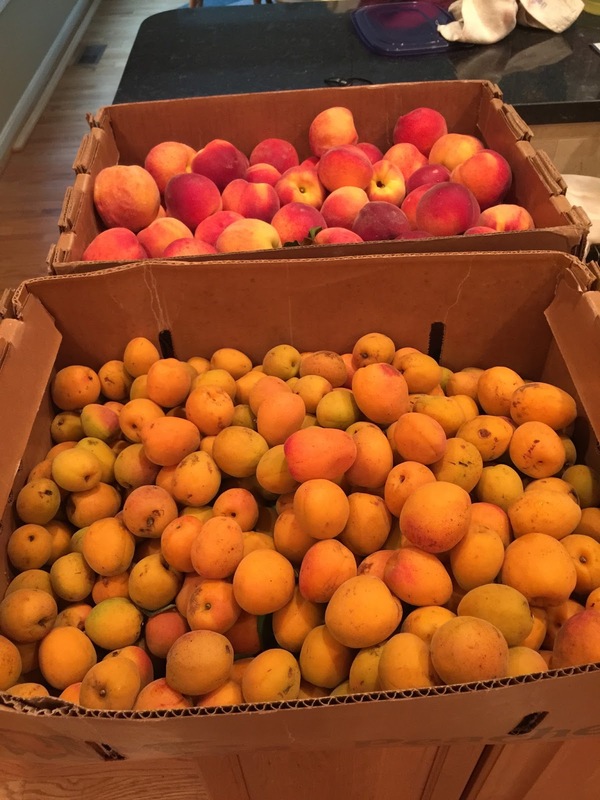 Summer fruit is in full swing here in Virginia, and after having just gone through a complete kitchen renovation, I felt the need to use all my shiny, new appliances and preserve some of the goodness of summer. 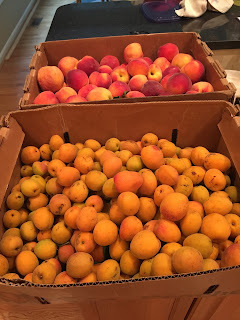 I visited a local farmers market and scored a great deal on 1/2 bushel of apricots and 1/2 bushel of peaches. Apricot and peach preserves were on the to-do list, but do you even know what a half-bushel of fruit looks like? Well, it's a LOT! I quickly determined that 20+ jars of apricot preserves is more than two people can eat in a reasonable amount of time, even taking into consideration that many of them will probably be given as gifts. So I searched the internet for other things to do with apricots and came across this recipe for Brandied Apricots. It was super easy to make and OH, SO TASTY! As I usually do with recipes, I changed it up slightly. I added a splash of orange and almond extract and also added a split vanilla bean to each jar to make it pretty and taste even better! I highly recommend warming in the microwave and topping some vanilla ice cream, or my favorite, Talenti Tahitian Vanilla Bean Gelato. 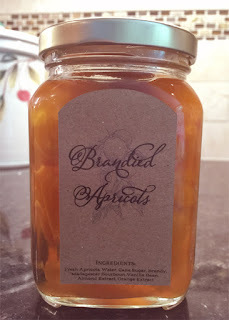 Plus, I think it will get better with age as the apricots soak up all that Brandy goodness, but honestly, I'm not sure it'll last that long in my house! So what does all this have to do with your Silhouette Cameo or Cricut? Of course I had to make a pretty label! And I am sharing it with you. This label is perfect for these awesome jars that I found here. Don't let the lids scare you -- they sealed just fine in a regular water bath just like the Mason jars do with the band lids. And if by chance one or two of them don't seal, just pop them back in the water bath! 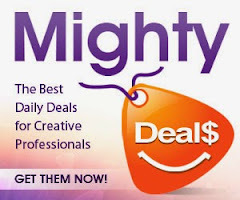 Click here to grab your FREE SVG file. 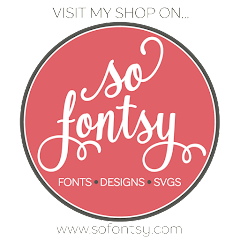 I put as many labels as would fit on my Silhouette Studio mat, added registration marks and printed on Silhouette's Printable Adhesive Kraft Paper then cut.